There are two easy ways to share your videos on VeganTravel.com. The first is to include a link to your video in a blog you share on our site. The other is to message us with some basic info, and have us create a portfolio page for you similar to the videos shown here. Vloggers are most welcome to share content from their YouTube or Vimeo channel. The choice of the content is entirely yours, we just ask that it doesn’t contain any disturbing or graphic images, and that it of course be vegan and travel related! Your videos are a great resource for your fellow vegans while helping demonstrate to the those considering going vegan, just how easy it is to live more compassionately and travel as ethical vegans. The blogging platform on VeganTravel.com is WordPress, and as a site vlogger you will have “author” rights and access to the back end of the site. For consistency purposes, we ask that you follow this set of rules as you prepare each of your posts to share on the site. Welcome Aboard! We’re so happy to have you as an active vlogger on VeganTravel.com! Any photos you would like us to use to help promote your video. And let us know your username on our site, so we can tag your video accordingly. That is all we need! As we don’t upload your video but simply link to your video, all views on our site count towards views on your YouTube or Vimeo channel. All videos are available on our Vegan Traveler Videos page, with most recent videos shown on top. Videos are featured in our relevant Vegan Travel Guide pages. Videos will appear in your Featured Vlogger page, if you choose to have one (see below). Vlogs about animal sanctuaries are featured on the pages above, and are also featured on our Animal Sanctuary Blogs and Why go Vegan pages. Our featured vlogger pages enable readers who enjoy one of your videos to easily find others you have shared on this site. These pages also provide additional exposure for your blog posts while letting our followers know about your website and other social pages you would like them to follow you on. If you like to be one of our featured vloggers, all we would need is a couple of photos (a profile photo and a banner photo for your page), and a bio of you written in 3rd person. You can see photo and bio examples from featured vloggers and bloggers here. Responding to comments on your videos on our site and our social pages. We encourage all our vloggers to feel free to respond to any comments you receive on your videos. We’ve noticed that the Instagram and Facebook algorithms favor posts with multiple comments and shares. Please support your fellow vegan bloggers and vloggers by liking and commenting on their blogs and videos as well. 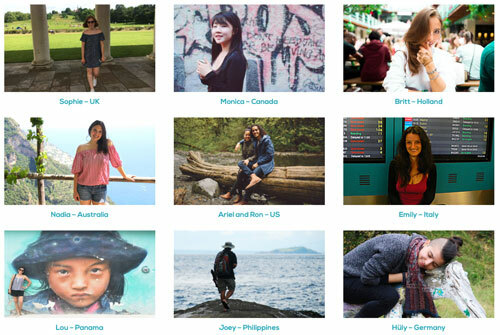 We are so thrilled to have you as a vlogger on VeganTravel.com! However, please note that all content must be approved by our team before it goes live on the site. VeganTravel reserves the right to deny or remove any content that does not align with our values. If the vlogger role is misused in anyway, we have the right to revoke vlogger access at any time.